Zephyrhills abounds with beautiful parks and recreational facilities that feature everything from swimming to picnicking, baseball to fishing. Clock Plaza, located in the historic downtown district on 5th Avenue features a bandstand and picnic tables underneath shady oak trees. Charles B. Krusen Memorial Park, situated on Alston Avenue east of U.S. 301 has a skate park, inline field hockey rink, picnic shelter with barbeque grills, lighted sports fields, playground, basketball court and concession stands. Depot Park, located at 39421 South Avenue is home to a restored 1927 Railroad Depot which serves as a museum. It also has a wooded walking trail, picnic shelters, barbeque grills, and a playground. East Pasco Family YMCA, at 37301 Chapel Hill Loop features basketball and racquetball courts and an Olympic-size swimming pool. Among the activities it offers are a day camp for children, group exercise, swimming lessons for all ages, and a Wellness Center with a multitude of exercise equipment. Lincoln Heights Park on Lincoln Avenue, east of Airport Road is a small neighborhood park with a picnic shelter, large swing set and basketball court. Gunner Paw Park, located at Alston and Meadowood Loop across from the municipal golf course is the perfect place for humans to romp with "man's best friend." Shepard Park, at the intersection of US 301 & A Avenue features scout activity buildings, picnic shelters, basketball court, swing set and an open play area. Transplant Park, situated at the intersection of 5th Avenue and 12th Street is a small park nestled beneath shade trees with benches where you can sit, relax and contemplate nature. Veteran's Memorial Park, on 3rd Avenue east of 20th Street features an unsupervised BMX track, open play area and a bicycle/pedestrian path complete with trees and benches. Zephyr Park, at 38116 5th Avenue is located on a lake and features lighted tennis courts, fishing, picnic shelters, grills, a playground, horseshoe pits and a fitness trail, as well as an interactive water park. 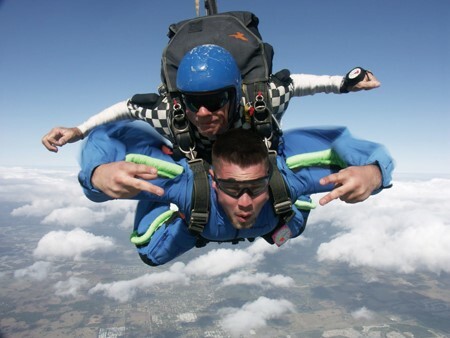 For the adventuresome, nothing beats an excursion to world-famous Skydive City. The 14-acre campus offers visitors more than just the thrill of a lifetime: it boasts a full-service RV park and on-site camping, an on-site cafe, a pro shop, a wingsuit school, and a swoop pond for canopy piloting. A bar nicknamed the "Bird House" also helps calm nerves with beer and wine, and its walls are covered in memorabilia from 50 years of skydiving at Zephyrhills Airport. The Clyde Bracknell Skate Park located on the corner of Alston Avenue and 20th Street is a state-of-the-art 8,000 sq. ft. all-concrete park designed by Team Pain. The bowl is multi-level with pool coping, tile and steel coping, escalators, extension, 5 corners and two hips. The street course includes quarter pipes, hips, china banks, textured banks, the Skate park repurposed, tons of rails and ledges, jersey barriers, and on one of the rails is an actual piece of railroad track. Whether you're looking to stay, or just taking a look around, we will be thrilled that you dropped by and even happier if you decide to stay.